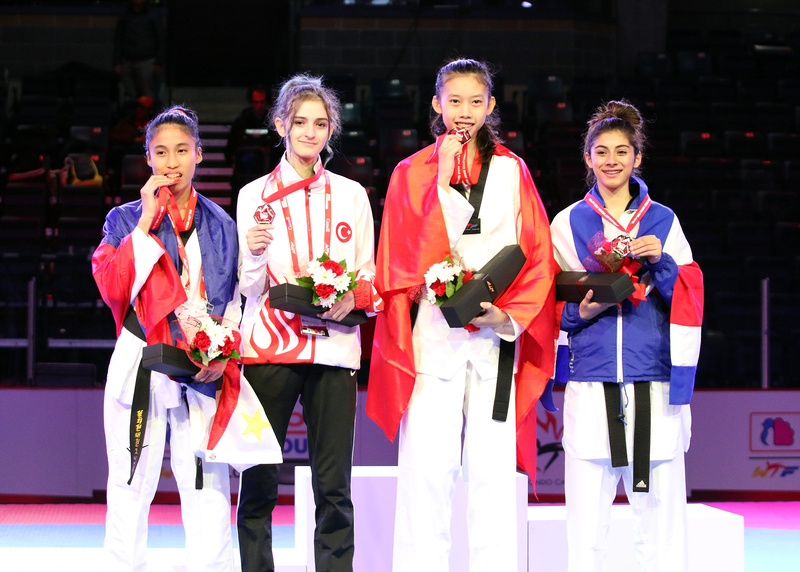 BURNABY, Canada (Nov. 16, 2016) – Gold medals went to Iran and Vietnam in the female categories, while Korea won both golds up for grabs in the male divisions on Day 1 of the 2016 World Taekwondo Junior Championships. 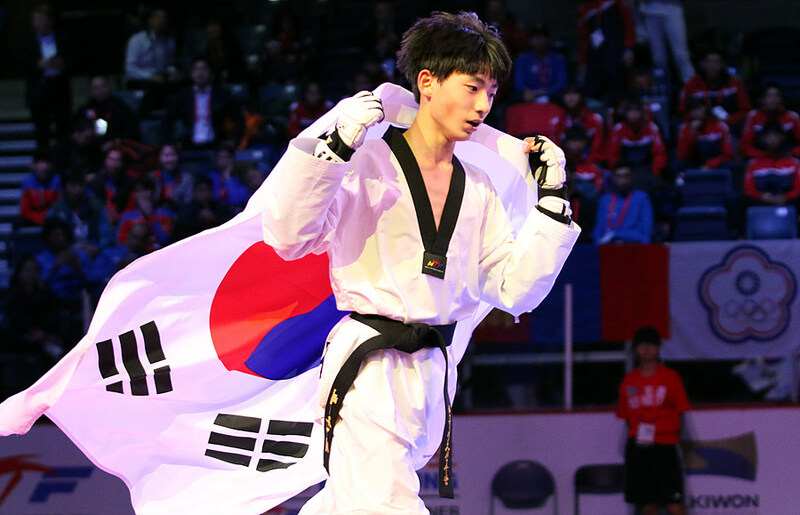 The championships, which WTF President Chungwon Choue called “a road map to Tokyo 2020” features athletes aged 15-17. Burnaby’s Bill Copeland Sports Centre was full to the bursting point, and with many nations fielding vocal, 20-person teams, the event rocked to a noisy aural backdrop. With 846 competitors and 458 officials registered, representing 102 countries, Burnaby 2016 is the biggest World Juniors ever. 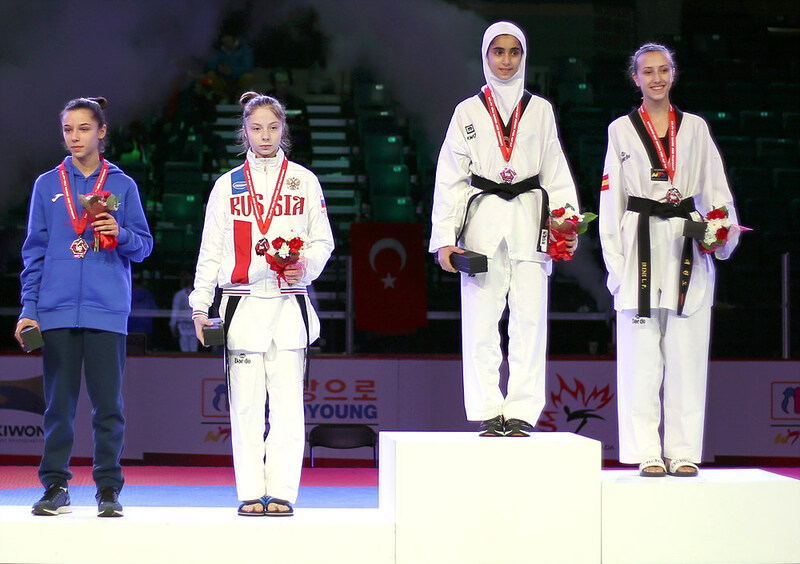 On the first day of the five-day competition, the lightest weight divisions were contested, with medals available in the Female -42kg, Female -44kg, Male -45kg and Male -48kg categories. 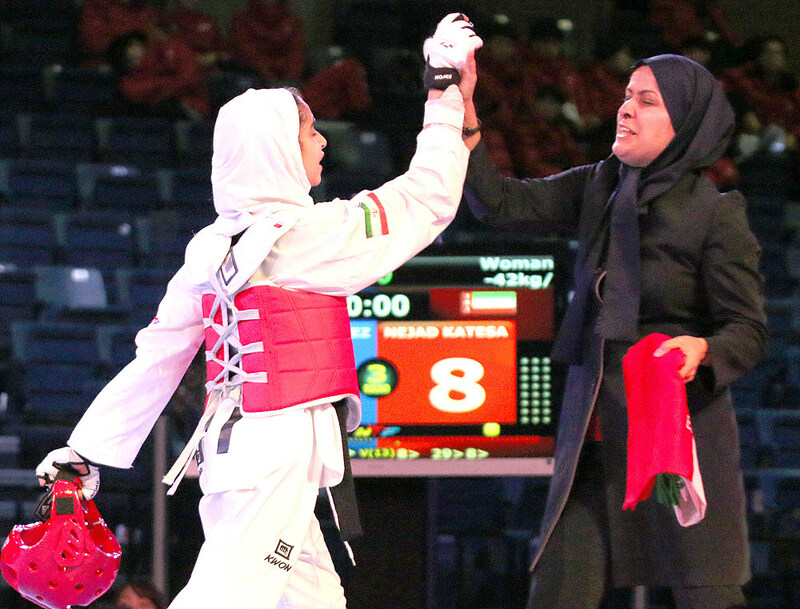 The final match of the Female -42kg category saw Mobina Nejad Katesari of Iran face off against the taller Irene Laguna Perez of Spain. But it was the Iranian, unintimidated, who opened the scoring, making contact with a head kick for three points. The Spaniard returned fire, sparking a series of lively exchanges, but the round ended 3-0. Very early in the second, the Iranian landed a second head shot to go up 6-0 – encouraged by her very vocal coach, whose shrieked instructions drowned out the crowd. Nejad Katesair fought much of the remainder of the round on the back foot, but offered her opponent an impenetrable defense, even when fighting from the perimeter of the mats. In the third, Laugna Perez went into full-on attack mode, and her coach appealed a head shot; it was rejected. The Iranian scored again, to go 7-0 up, then her coach, too, appealed a head shot; it too was rejected. When action resumed, she connected again with a kick to the body. 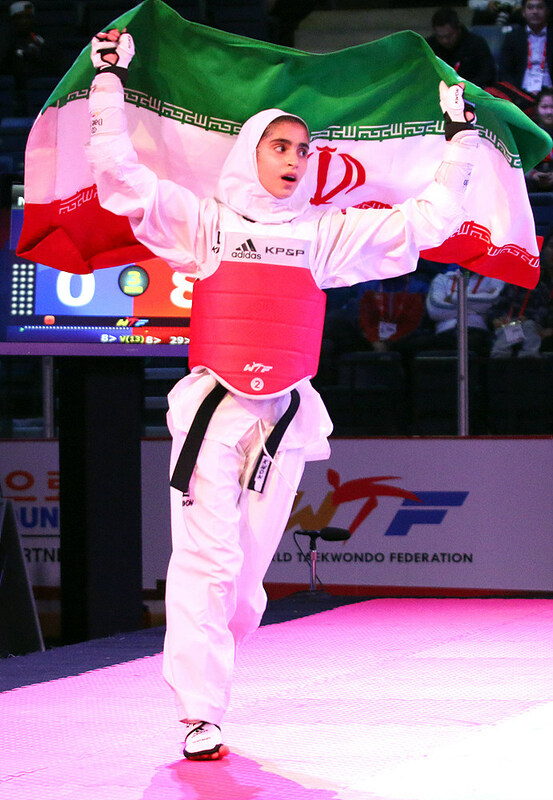 The match ended 8-0 to the Nejad Katesair, leaving Laguna Perez with silver. The Iranian girl has a rare combination of head-kick accuracy and fortress-like defense – surely, a star of tomorrow. Bronzes went to Sofia Zampetti of Italy and Karina Ushakova of Russia. 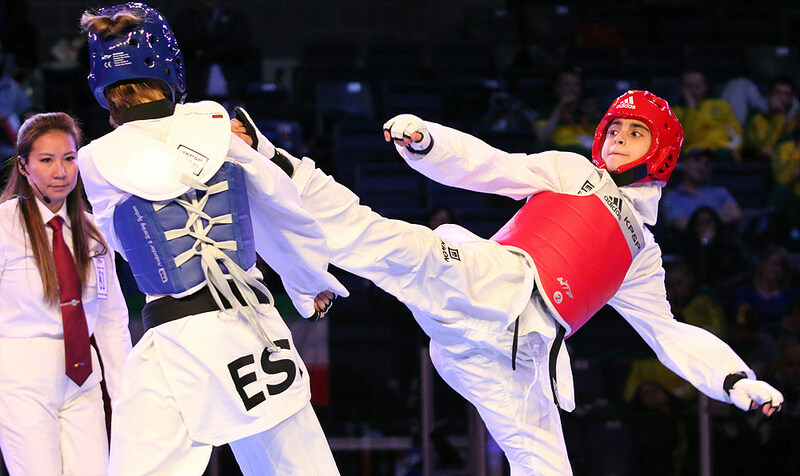 In the Female -44kg category finals, Maria Calderon of Costa Rica took on Thi Kim Ngan Ho of Vietnam. Both fighters started fast and both visited the mats in a clash, but then settled; the round ended 0-0. 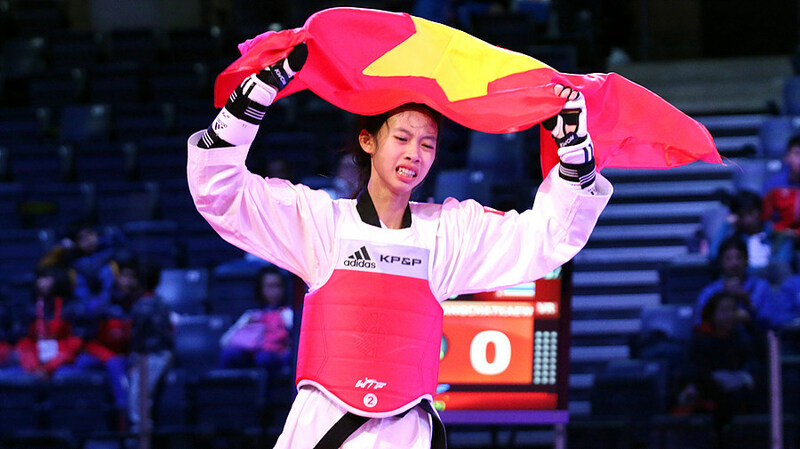 In the second, the taller Vietnamese girl landed a head kick, going three points up, ending the round 3-0. In the third, Calderon was desperately trying to land, but could just not get past Ho’s long and very versatile front leg, and lost another point on penalties. In the last 12 seconds, things got rough as the frustrated Calderon attacked and Ho went down outside the mats, losing two points for falling twice, and then a third time, but still ending it 5-2, taking gold and leaving Calderon with the silver. 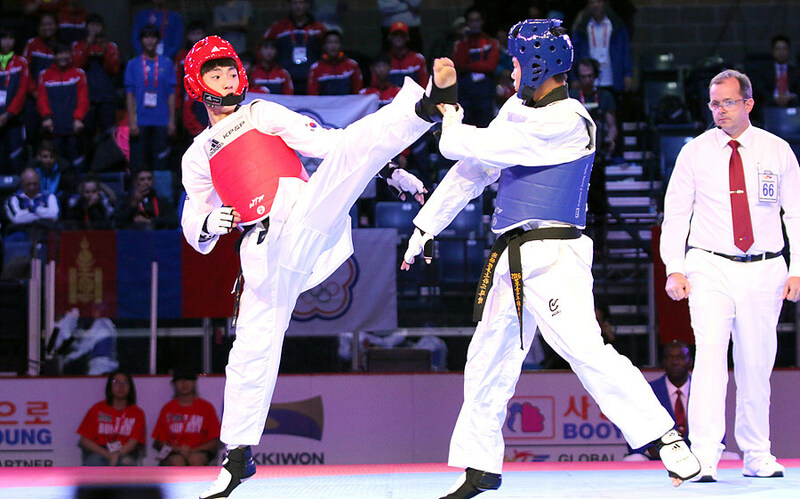 In the male -45kg category, Cheng Chun Chang of Chinese Taipei – who had impressed the taekwondo punditry earlier in the day by handily beating a succession of taller opponents with a fearless, attacking style – took on Jun-seo Bae of Korea. Round 1 was gently paced, with both lads feeling out the distance, Bae kicking more, Chang using footwork to stay out of trouble. It ended 0-0. 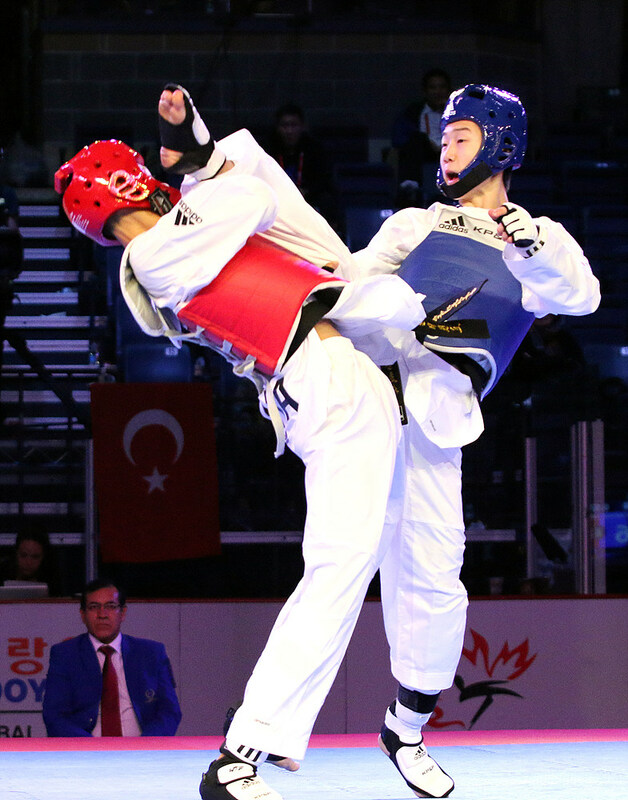 In Round 2, Chang raised his game, but it was the Korean who lit up the scoreboard, winning three points with a fast and perfectly aimed combination of 1-2-3 body kicks. The round ended 3-0 to Bae. In the final round, Bae had found the range, going four, then five points up. Chang tried a series of high spinning kicks, but was unable to land. 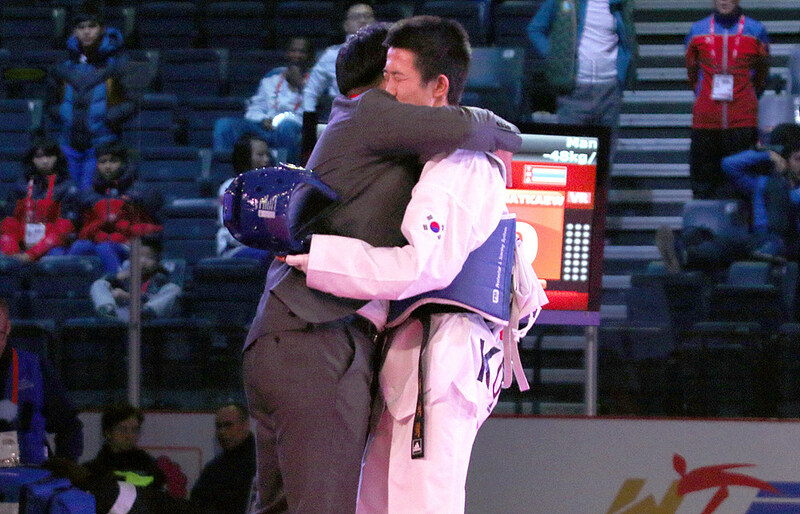 The match ended 5-0 – a very skillful display by the Korean, giving him gold and leaving Chang with the silver. 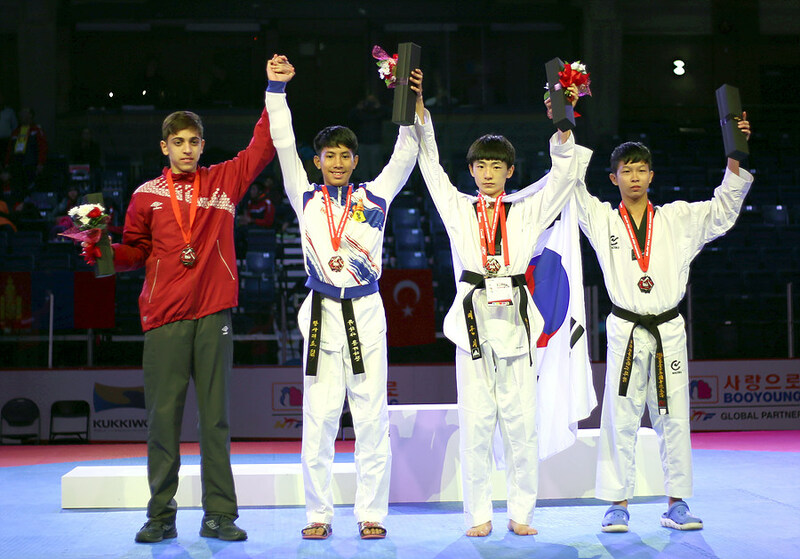 Bronzes were shared by Ayaz Ganbarli of Azerbaijan and Yutthaya Khongkraphan of Thailand. saw more action with ax kicks, spinning back kicks and punches flying fast and furious from both fighters, but with no score from either. In the third, Bae went up to nine after firing a body punch-head kick combo, while his constant movement and attacks were making it almost impossible for the Thai’s target radar to lock on. With the round only half over, Bae landed a picture-perfect ax kick to Tangchatkaw’s face, ending the match 12-0 on point difference. 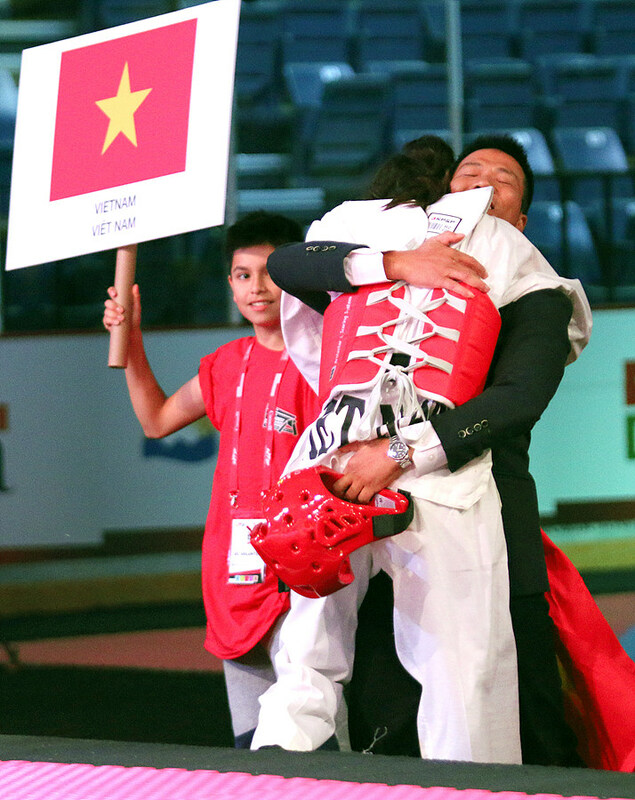 It had been a masterly display of fast-moving, accurate taekwondo by Mok that gave him a deserved gold and Tangchatkaew the silver. 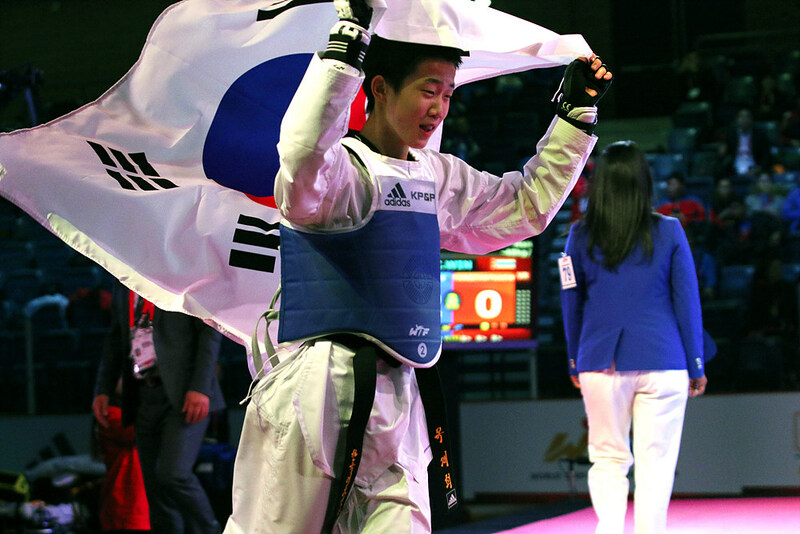 Mok’s victory, following Bae’s, suggests that Korea’s taekwondo talent pipeline is positively gushing. 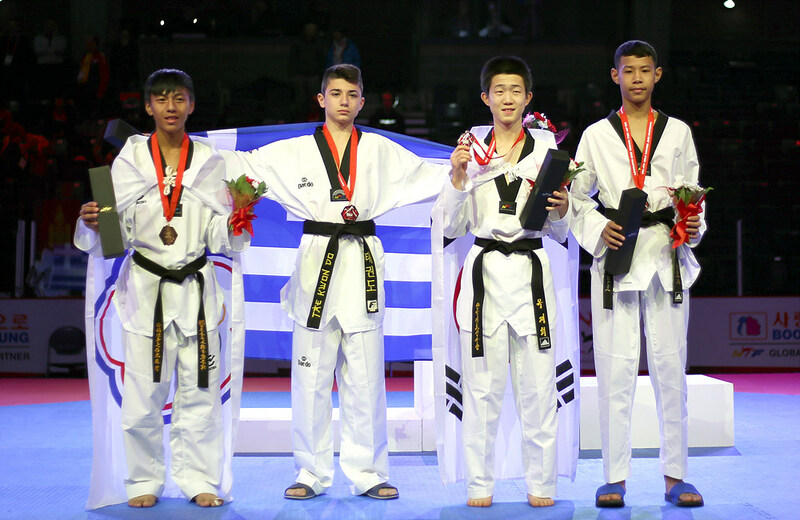 Georgios Ioannou of Greece and Ting Wei Tai of Chinese Taipei went home with bronzes. Prior to the finals, the opening ceremony featured an honor guard of Royal Canadian Mounted Police in full dress uniform, and was themed after the diversity and multiculturalism that defines both the city of Burnaby and the WTF. It featured a local choir, a native Canadian wolf dance troupe, Highland pipes and drums, and a drum, dance and taekwondo performance. At the conclusion of the ceremony, Choue kicked off the “THF Challenge,” designed to raise funds for the WTF’s humanitarian initiative, the Taekwondo Humanitarian Foundation, or THF. The challenge, themed “Break Boards, Change Lives” involves breaking boards, pledging donations, and then posting related videos online. He was joined in the challenge by Burnaby Mayor Derek Corrigan, who won applause with a pledge of $5000, and by WTF Council Member Ali Sagirkaya, who raised laughs when he smashed a board with his (bald) head. A THF booth has been set up in the venue so that athletes and visitors can take the challenge over the next four days. 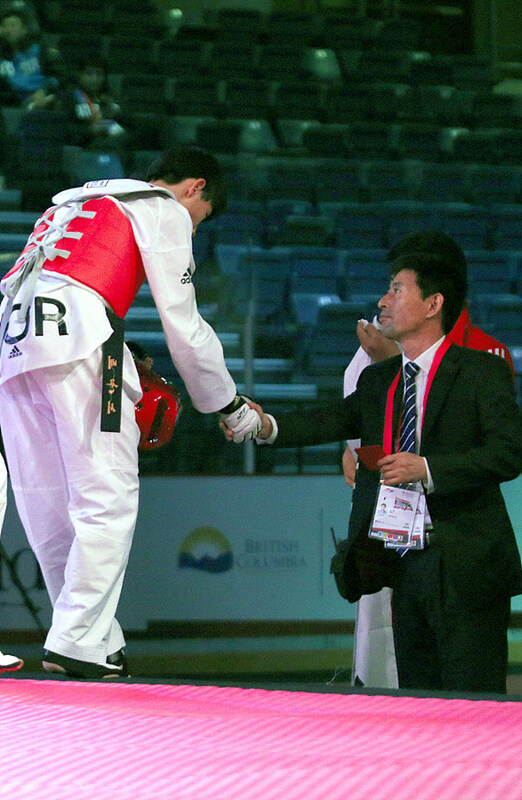 Choue also urged the taekwondo grassroots worldwide to get involved. All funds raised will go to support taekwondo programs in refugee camps. 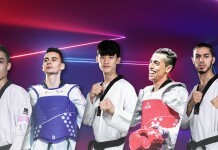 Just prior to the award ceremony, Kukkiwon President Hyun-deuk Oh, African Taekwondo Union President General Ahmed Fouly, Asian Taekwondo Union President, Kyu-seok Lee and Pan American Taekwondo Union President Ji-ho Choi, all took the THF Challenge. Lee impressed the crowd by asking them to nominate a technique – the technically difficult spinning back kick was chosen – and which foot they wanted him to use. He then shattered three boards with so much power that the board holder was hit by the remains. Making Lee’s feat doubly impressive is his age: He is over 70.